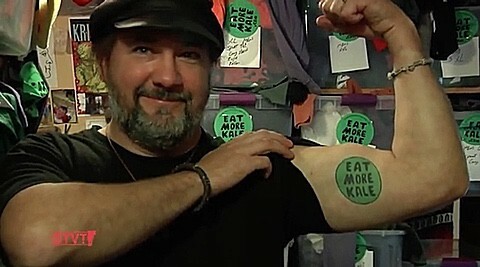 In 2011 Chick-Fil-A sent a cease and desist order to Bo Muller Moore claiming that the Vermont artist's "Eat More Kale" t-shirts, created to promote local agriculture, infringed upon Chick-Fil-A's slogan "Eat Mor Chikin". During the David-and-Goliath-esque battle that ensued, Chick-Fil-A's lawyers barraged Muller-Moore with 30 examples of other companies which had faced similar claims against the anti-gay chicken giant, and had turned tail and ran, according to the AP. Muller-Moore persisted and with the help of social media was soon joined by a number of volunteer lawyers who helped with the litigation. State officials also stood by the artist. On Friday, outside the Vermont statehouse, Muller-Moore announced that the U.S. Patent Office had granted his application, though he had no idea of the specifics on the decision. "I'd like to think that maybe some persistence and polite defiance, you know, and proving to them that we were in it for the long haul," he said. "If it took us a decade, we're going to fight for a decade." And buy an 'Eat More Kale' t-shirt here.